We want to stay in touch with you once you begin the next chapter of your life after Freed-Hardeman University. Don't forget to come back and visit us! Share what exciting things are happening in your life with your FHU family! 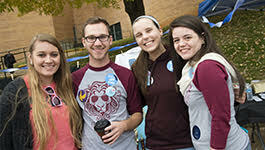 Keep in touch with former friends and classmates by getting involved with our FHU group on Facebook. Need assistance with career development and college to career transition? Let the University Career Center assist you. The FHU Alumni Office is excited to offer FHU Connect, a new alumni service that allows you to interact with other alumni. This service is only available to FHU alumni.